· Eminent Architects – Ar. Sen Kapadia, Ar. Sonali Bhagwati and Ar. Anup Naik adjudicated the entries. · More than 170+ elite architectural institutions across the Country took part in the Biggest Architecture and Design Competition for students in India. · The Grand Finale of the Transparence 2016 featured Ar. Padmashri CN Raghavendran’s Keynote address and also hosted ArchumenPro – India’s largest Quiz for Architects. 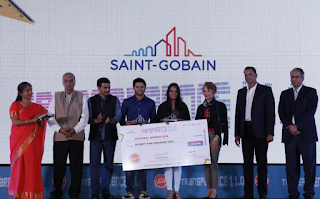 Chennai, February 14, 2017: Saint-Gobain India Private Limited, world leader in habitat solutions, in association with Ethos conducted the Grand Finale of the eleventh edition of Transparence in Chennai. Transparence, India’s largest competition for students of Architecture and Design, is Saint-Gobain’s annual forum to showcase student talent from the Colleges of Architecture and Design in India and gives them an opportunity to get mentored by the who’s who of Indian and global architecture. Into its eleventh edition, Transparence 2016 received over 200+ team entries for showcasing Design ideas under the theme SPACE IN MOTION for imagining and creating a Centre of Performing Arts at Pragati Maidan, New Delhi. These entries were scrutinized by elite practicing architects from across the North, West, East and South zones of the country during the Regional rounds. 8 National finalist teams from the Regional rounds, of the competition battled it out for the coveted National Awards in front of a LIVE jury and a host of architecture students and practicing architects across the country. Mr. B Santhanam, President and MD - Flat Glass South Asia, Egypt and Malaysia Saint-Gobain India (P) Ltd along with the jury awarded the National Winners. Kunal Jain and Shivani Agrawal of IPS Indore bagged the ultimate glory and emerged to be the National Winners of this year’s competition and were awarded with a Citation, Trophy and INR 75,000/-. They were followed by Aishwarya S R, Raghavvendra G V and Raksha Manohar Shetty of SIT Tumkur, who stood National Runner up- I. They took home a Citation, Trophy and prize money of Rs. 50,000/- . Rishab Arora and Rijul Nayal of Gateway College, Sonepat, along with Saurabh Sharma, Aishwarya Dwivedi and Aditi Rai of MNIT Jaipur were appreciated with Consolation prizes. As a part of the this year’s event, Saint-Gobain Scholarships worth INR 1,00,000 each to 2 deserving recipients for their disruptive ideas on amphibious transit shelters and using bamboo as reinforcement. Saint-Gobain is also evaluating two other projects on algae air filtration panel to combat pollution and of architecture for the scholarship. Transparence 2016 also hosted ArchumenPro: India’s Largest Quiz Competition for Practicing Architects, which was well received by firms and architects across India. Prize money of Rs. 50,000, Rs. 30,000 and Rs. 20,000 was awarded to the National Winners, Runners up – I and Runners up – II.